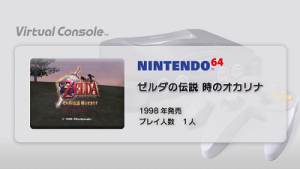 We in North America and Europe have had Ocarina of Time available in our eShops sice July, but Japan has only just recieved it today. This is rather odd, as Japan often gets a shot at Nintendo titles first. Either way, a new Japanese trailer has been uploaded to Nintendo of Japan’s YouTube channel, with some memorable moments from the early parts of the game. Funny that this game continues to release on new platforms in every region, and even top download charts even today, so very many years after original release. Especially at a point in time when a newer, 3D version is available on a portable platform. That just goes to show the quality of this classic masterpiece. It certainly is fun to go back and play the original version, though, with those insanely blocky models and flat, gritty textures. Really tugs at the nostalgia. Did you guys get Ocarina of Time on Wii U VC? Why do you think Japan had to wait so long as compared to the other regions? Drop a comment.